The NDA government on Tuesday announced that it is banning use of Rs 500 and Rs 1,000 notes, in its fight against corruption, fake currency and black money. The incidence of fake Indian currency notes in higher denomination has increased. The fake notes are used for antinational and illegal activities as high denomination notes have been misused by terrorists and for hoarding black money. Since India remains a cash based economy, the circulation of fake Indian currency notes continues to be a menace. 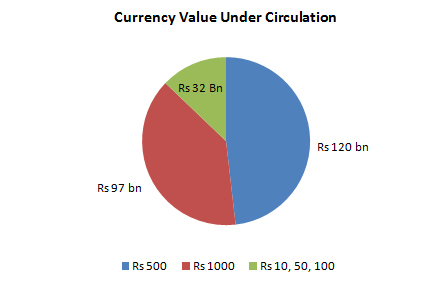 In consequence thereof, 86% of the value of Indian currency currently in circulation became useless if not legally earned post midnight of November 8, 2016. Exchange of old notes for New of Rs 500 and Rs 2000 with legitimate identification. The High denomination notes can be exchanged for value at any of the 19 offices of the Reserve Bank of India or at any of the bank branches or at any Head Post Office or Sub-Post Office. For exchange upto Rs 4000 in cash you may go to any bank branch with valid identity proof. For exchange over 4000, which will be accorded through credit to Bank account only, you may go to the branch where you have an account or to any other branch of the same bank. Impact on the primary residential segment will be softer as the buyers in this sector are driven by mortgage. However, major impact will be felt in the secondary market and the unorganized developers community where there are still cash dealings. Housing prices could witness downward pressure, helping revive demand in the sluggish housing segment. With liquidity drying up, both NPA and demand for working capital credit are likely to go up. In view of bank’s ongoing NPA issues, how fast will banks react to this situation will be interesting to watch. India will see much sharper move from unorganized to organized segment. The CASA float could rise over the next few months with no limit on public deposits and limit on exchange of notes. This short term lack of liquidity will also provide room for inflation to ease further, supported by reduction in consumption expenditure of the masses. This will provide stimulus to RBI to reduce Interest Rates further. In the long term, interest cuts will induce economic growth. As a result, long term benefits will outweigh short term contractions. India has made the first move from cash economy to a digital economy. Larger amount of savings and cash will find a way into the mainstream economy and be deployed for physical and financial asset creation. Use of digital currency and payment systems driven by UPI, wallets and cards will create enormous transparency and paves way for faster evolution of Fintech companies in India especially in transactions and Online lending space. This move should improve India’s position on transparency and corruption in the global league table enabling higher capital flow (FDI/FII) into India.